Its our second day in Korea and it’s getting harder and harder to wake up early. The weather was pleasant but the temperature is getting colder especially during the evenings. After touring the city, it’s now time to go somewhere far. Nami Island is 63 km away from Seoul in the direction of Chuncheon. It became famous worldwide due to the “halyu” drama Winter Sonata. Nami Island is not only for K-drama fans as it has a lot to offer to everyone. Namiseom (Nami Island) is a small island that was formed between Gyeonggi-do and Gangwon-do following the construction of Cheongpyeong Dam. The island features expansive fields of green, groves of trees, leisure facilities, accommodations, and special galleries. It became famous when the drama ‘Winter Sonata’ shot some scenes in the island. (source: english.visitkorea.or.kr). There are several ways to get to Nami Island from Seoul. First there are shuttle buses to Nami island that has daily schedule and secondly you can take a bus or subway going to Gapyeong station. The shuttle bus has a schedule and since we woke up late we decided to take the train instead. From Gapyeong Station, we took a taxi to Namiseom parking lot, we went directly to ticket booth. I noticed the signs says Nami republic, It’s not really a sovereign country maybe they just wrote those signs for marketing purposes. After buying the tickets we went inside the ferry from Namiseom Dock to Namiseom Island. It just took as about 6 min to reach the island. Aside from being the setting for the K-drama, the island is also famous for its beautiful landscape and beautiful tree-lined roads. Its Just an hour away from Seoul so a lot of families and couples visit the place. As an artist, I really enjoyed exploring the Island, installation arts are scattered around and it ranges from modern to Korean folk art. You may not see any electrical or phone wires around because they are all underground, this was done to keep the natural beauty of Nami. In the evening they turn off the lights for the visitors to watch the stars and moon. The sun was starting to set and the temperature was dropping thankfully there are little bonfires that kept us warm. We rode the ferry back to Namiseom dock, and it’s already 6:00 pm so we got a taxi and asked if he can take us to La Petite DE France. Unfortunately, the taxi driver called the place and informed us that it was already closing. We were disappointed so we just asked the driver to take us back to Gapyeong station. maybe we can visit it next time.Lesson learned time management and waking up early. Hongdae-ap (the area in front of Hongik University) is a neighborhood known for its youthful and romantic ambience, underground cultures, and freedom of self-expression. Unique cafes, cozy galleries, accessory stores, fashion shops, live cafés and clubs, art markets, and gourmet eateries make this a popular hang-out for locals in their 20s and 30s and a fascinating place to walk around. (source: english.visitkorea.or.kr). We took the Subway and alighted at Hongkik station ,there where a lot of shops and cafe’s. Since it near the University there are a lot of young people and artsy places. There are also performances on the street. There are also bars with different branches in the same area. I don’t have a lot of pictures since my camera phone was already dead. There are also shops that sells trendy clothes and accessories. 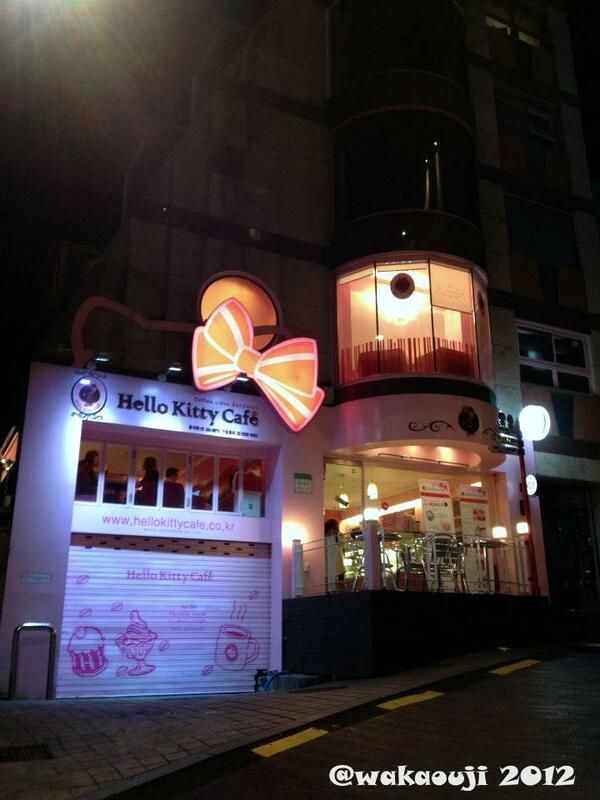 One interesting cafe we saw was a Hello Kitty themed restaurant. Hongik University Station (Seoul Subway Line 2 or Airport Railroad). This time, my cousin (from my late father’s side) & her soon-to-be hubby, my 2nd cousin or pamangkin (actually it’s my older cousin’s daughter, from my mom’s side) and I better come to visit Nami Island so we won’t it. That’s why if we chose a shuttle bus, you gotta make a booking for reserving our own seats right? Because I’ve read somewhere on google search. I got a bit confusing whether to do it online or at the window counter. I need to do this when I’m with 3 others to Korea next year. I’m going in Spring time (Korea which I dislike hay fever allergies like sneezing, runny nose etc.). But I had to bring something to avoid pollens, dust etc. I can’t wait! Oh Hello Kitty is what my cousin wanted to go there even at Hongdae too. Ps. Sorry my longer rants LOL! Hi Ian, Sorry im not sure how to take the bus to Nami, and I agree that taking the train was really confusing. Spring is a lovely time to visit Korea maybe just bring mask to avoid nasty allergies :). Anyway if you need more information just visit http://www.visitseoul.net/en it’s the site I used when I was Planning our trip.